Are you noticing communication with your customers ends up in the spam folder of the larger ISP’s like Gmail, AOL and Yahoo.com? We recently did! Customers complained that they never received an web hosting invoice or domain renewal notice. Some were mad because support did not reply to their issues. Luckily all of them offered small free accounts so that we could test each one out. MailGun, JangoSMTP, Elasticemail and PostMarkapp have the big advantage of a very fine grained step up in cost. You only pay for the number emails you send out and get the same features for any plan you are on. With Socketlabs you also get (almost) all the features in every plan but the cost are much steeper and have some big gaps in between. Sendgrid starts pretty cheap ($9.95 per month for 40000 emails) but you only get a subset of features with that cheap plan. Missing are Whitelist services, Feedback loops and such. The next step up is already $80 per month for 100.000 emails. A plan right in the middle would be nice. After the first round of testing we were pretty much set on SocketLabs but during actual use we noticed a feature missing in SocketLabs that was provided by Sendgrid and that is an automatic insertion of a un-subscribe footer. We are relying on some non-opensource software and so we can not add functions and features such as a un-subscribe link to them. Sendgrid simply does this for us. As you can see, each of these Services have a lot to offer and it really depends on what exactly you need to make a decision what is the best. We ended up with Sendgrid for now (see update below) and are enjoying a much more consistent communication with our customers. It also just feels much better if you KNOW your email will arrive at the recipients Inbox. One last thing that is quite nice and provided by all five of the services are very detailed statistics about your email even down to if somebody opened the e-mail or clicked on a link within the email. 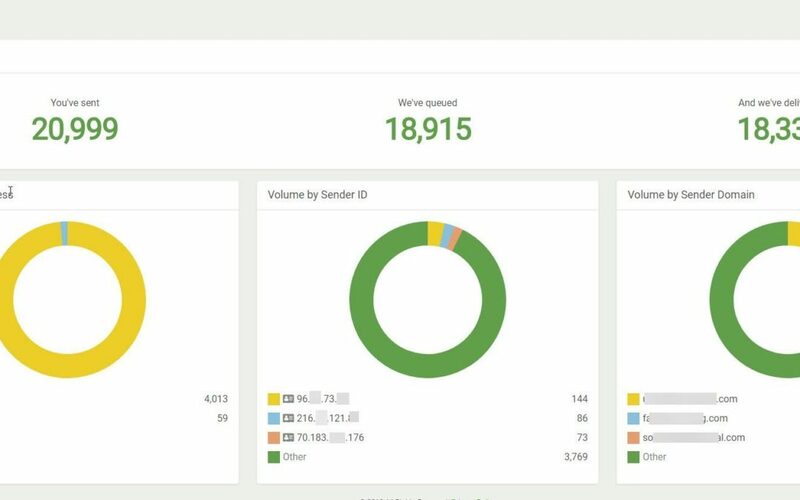 We recently switched to Elasticemail which starts at $0.99 per thousand emails. Esp. interesting is the fact that for a small additional fee you get a dedicated IP address. This means, that you are the only one using this IP address which again improves the chances that email actually arrives in the customers inbox. Another switch! We have now switched to MailGun which provides us with up to 12.000 E-Mails per month for $0.